I few months back, I've wrote about the new climbing garden that had opened close to where I live. I did say that it 'does look like fun'. For some strange reasons I seem to think, I don't have enough knitting patterns. 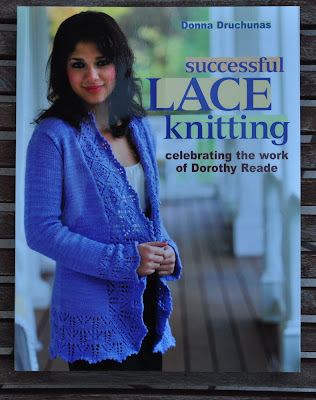 I don't know exactly how this can be, as I already have plenty of books with knitting patterns, particularly for socks. Still, for my birthday a few weeks ago I put a coulple of pattern books on my wish list and, thanks to my good friends I got them all. 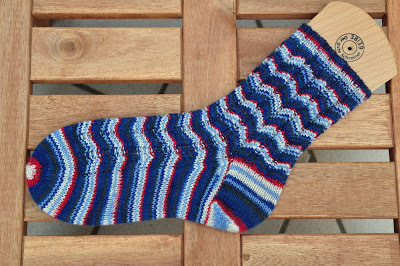 First is a book with socks patterns. I do have the predessesor, called 'Socks Socks Socks', which I love, and the new one is also pretty damn cool. 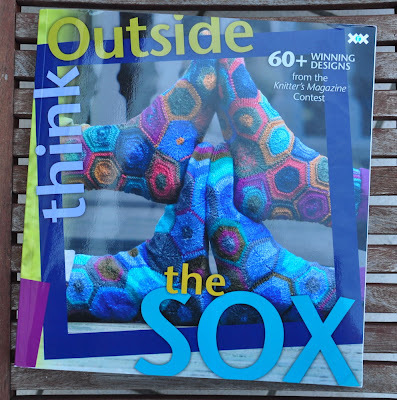 The titel is 'Think Outside the Sox' (which I believe is a bit lame ...) and contains the winning pattern from a sock knitting contest. I particularly like the one pair on the cover, but for now I have cast on a different pattern from the book. 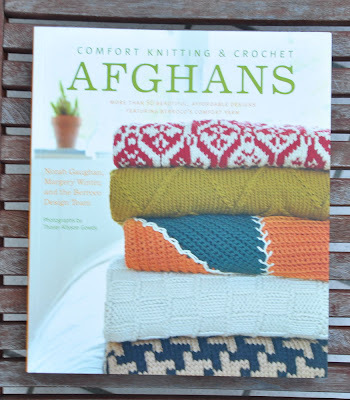 Second book is a more basic book with about fifty knitted or crocheted afgans. Heat is still on. There was a bit of a break beginning of the week, but now we're back in the mid-thirdy degrees. Well, I guess that's why they call it summer. 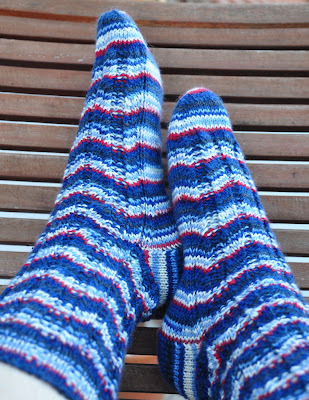 I finished the socks for my mom. I managed a pretty well matched pair and I like how they came out. The yarn is Regia World Color 'Paris' and the pattern is my own. My mom wants some anti slipping protection, so I'm going to put some rubber stuff on the soles. Should be done soon, but with the weather as is, I doubt see needs them very soon. I started already the next pair. Pattern here is called Calendula-Zopfsocken (yep, it's a German pattern) and the yarn is from online called Trend-collection Linie 1 Supersocke. I adore the color, which is a bit paler than in real life in the picture below. 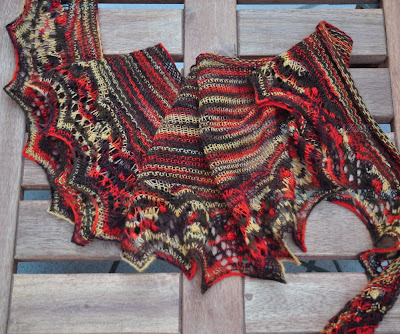 I did also finish the Annis shawl, which was a nice and simple knit. Only, I do have the feeling I did something wrong. a) I used only about half the amount of yarn stated in the pattern and b) it does look much smaller than the other finished object in Ravelry. I have no idea what I did wrong. I checked the pattern. Repeateably. 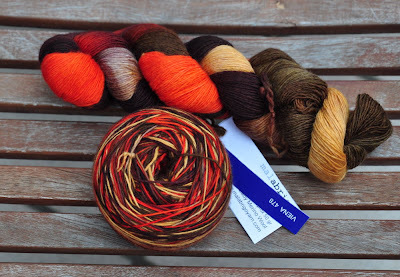 I'm also not happy about the color of the yarn (I do love the yarn itself - it is dreamingly soft). Currently, I'm thinking about dying the scarf either all in brown or in black. There's no hurry though - I doubt I'm going to need a scarf/shawl in the near future. I did mention it's hot, right? Summer has arrived. Yesterday, we saw a new heat record for this year with 37 °C. Which is waaaaaaay too hot. World Cup is still on and our team is doing very well - I watched the quarter finals yesterday and enjoyed how they seriously clobbered the Argentinians. 4 : 0 - well done!!! Luckily for all those brave Ironmen and Ironwomen who are doing the 3.8km swimming, 180km on the bike, followed up by a lovely little marathon, the temps have dropped a good ten degrees since yesterday, so it was not at terrible as it could have been. 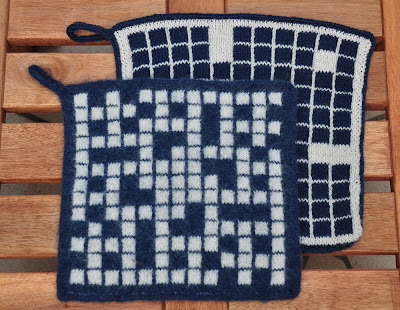 I did finish the second crossword potholder - though it's not fulled yet. 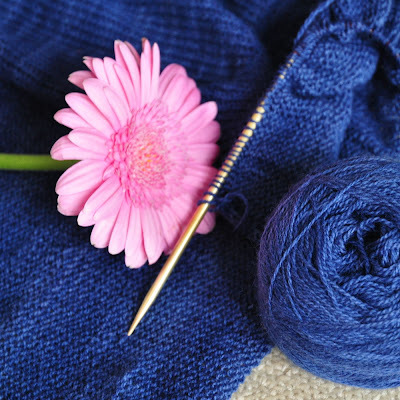 Both are knitted to the smae number of stitches (though the pattern is slightly different). I will do the fulling, when I have a few more things together. There is no hurry. I made some progress on the Featherweight Cardigan. I finished the yoke and put the stitched for the arms on same waste yarn. Now I'm knitting on the body. 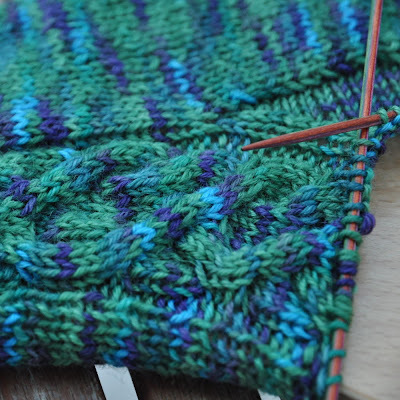 It's fairly straight forward stocking stitch, no counting or attention needed. Perfect TV knitting. My mom requested new socks, as one of the pairs I've made for her is starting to develope holes. I'm happy to oblique, especially after she picked out the wool. It's not a fancy pattern, just something I came up with. I wish it would zigzag a little bit more, but I've tried some variations and all turned out ugh. I like it - what about you, mom? I'll bring the one sock over next Friday for a fitting. Finally, I started knitting a small shawl from some yarn I picked up a while ago. I'm not sure what I was thinking with this color combination - it is rather wild.